The Beckman Allegra X-15R Refrigerated Centrifuge is perfect for all temperature sensitive cell separation applications. The Allegra X-15R features optimized recoveries and fast processing to meet the demands of high volume laboratories. The Beckman Allegra X15R increases workflow by delivering a maximum RCF of 11,400 g and top speeds of 10,200 RPM. 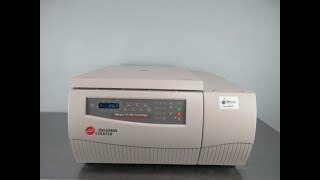 In addition, this Allegra Refrigerated Centrifuge from Beckman Coulter carries up to 10 independent acceleration, 11 independent deceleration programs and 10 user programmable profiles, a brushless induction motor, and a hold or pulse timer of up to 99 hours and 15 minutes. This blood centrifuge is capable of performing both fast and slow blood component, allowing it to harvest up to 3 mL of microbial cells are made possible in just 14 minutes. The reliable Beckman Allegra X-15R Refrigerated Centrifuge can also work with cell culture flask adapters to allow direct centrifugation of cell culture flasks and eliminates the transfer step to and from conical tubes for cell separation. This does not only reduce the chance of contamination, but also saves time and labor. The Beckman Allegra X-15R spins up to three liters of sample at an industry leading 5,250 x g with a quick cool system which goes from ambient to 4C° in less than 4 minutes. This centrifuge accommodates the SX4750 swinging bucket rotor, built from sturdy stainless steel, with a nominal capacity of 3 liters. The Beckman Allegra X-15R Refrigerated Centrifuge has been fully tested by our service team and passed with a clean bill of health. We have tested the benchtop centrifuge at it's maximum speed and minimum temperature setting. System is in excellent working condition and ready to ship.